Published in April, the original English version of the e-book, was a collaboration between NextBillion and Ashoka. It combined more than twenty articles posted on NextBillion from a very diverse group of authors with various specializations and from geographic locations, but all closely aligned with the field of affordable housing. The release of the ebook was very well received, and we fielded many requests for a Spanish version. 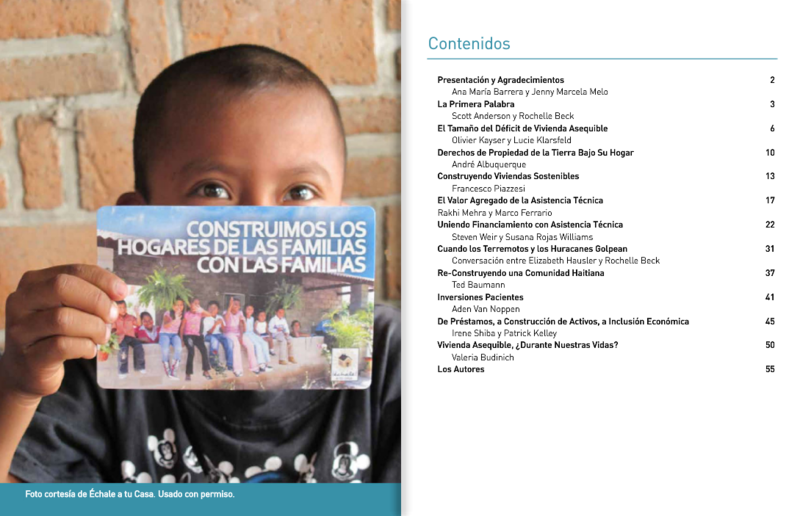 Taking these requests into consideration and to create a contribution to feed discussions and reflections on affordable housing in Latin America, the Ashoka’s Housing for All Program and NextBillion en Espanol translated ten of the in-depth articles included in the original ebook. We selected articles that cover innovative ways of approaching the different barriers to housing access in the Latin American market. These perspectives range from innovative financing schemes to the use of new building materials and community development programs to affect change. We are pleased to share with you the result of this initiative that was made possible thanks to the participation of many volunteers. We especially thank the group of six volunteers from across Latin America who responded to our invitation via social media and joined the initiative to make it possible, they include: Ángela Marcela Hernández Camelo, Angeles Small, Asaía Palacios, Carlos González-Rivera, Marco Antonio Bustamante and Martha Liliana Piñerez. We also thank Francesco Piazzesi who translated his own article into Spanish. The e-book, which is available for download and consultation, was presented in person on last week during the Adequate Housing Meeting for Latin America and the Caribbean which took place in Bogotá. During the release, Ana Maria Barrera, the director of Ashoka’s Housing for all Program, did a brief review of the book’s different cases of social innovation and later invited Steve Weir, Global Vice President of Habitat for Humanity and Susana Rojas Williams, Director of International Initiatives for Habitat for Humanity, to discuss the articles they themselves wrote. The Adequate Housing Meeting, organized by Habitat for Humanity, ONU-Habitat, Cruz Roja and Corporación Minuto de Dios, was attended by approximately 300 people from all parts of the continent. The four-day meeting provided an opportunity to share experiences and knowledge to find solutions to the housing deficit and the development of sustainable and inclusive cities. The event was attended by leaders in the field of housing such as Jonathan Reckford, CEO of Habitat for Humanity; Michelle Bachelet, former president of Chile; German Vargas Lleras, Housing Minister of Colombia; and Henry Cisneros, former United States Secretary of Housing and Urban Development. We hope that this e-book will broaden the debate and understanding around affordable housing taking place across Latin America and the Caribbean.